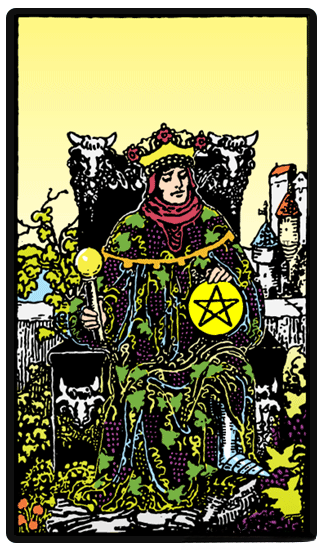 When we meet the King of Pentacles, we feel immediately his regal and generous presence. He is a provider and a protector, for under his care is a flourishing and abundant kingdom where its citizens are prosperous and encouraged to grow. He is naturally responsible and reliable, and through the wisdom granted to him by his suit, he has grown all that he has acquired from practically nothing. To see him in the cards is to envision success - one that was won by earnest work. He is a provider and a protector, for under his care is a flourishing and abundant kingdom where its citizens are prosperous and encouraged to grow. Generally, this card reminds us to stay in control of our energy and our resources in pursuit of a larger goal. When it comes to work, the King of Pentacles may refer to a more established man who will pay a significant role in your career. This man can be wise and rational, but he may also be careless when passing judgment. He can be your biggest supporter, but be prepared to receive unsolicited and harsh criticism. In love, this can indicate that the person that you ve been waiting for can come along and will love you for who you are. With regards to finances, the King of Pentacles is one of the best cards to receive. This may mean that your financial situation is stable as a result of your wise investments and hard work. In case you are taking a gamble, be sure to initiate a calculated action. When reversed, the King of Pentacles falls from his throne. Once the king of a prosperous kingdom, it has been taken away from him, or lost. Disconnected from the energy of his suit, he may have been impatient, he may have been too indulgent, he may have gambled too far and overstretched himself, he may have sought shortcuts that led him to ruin. He may become too focused on the material, only understanding the cost of things, and never their value. The King of Pentacles reversed may also signify that your definition of success and happiness is only determined by outer appearances, and not by the true value that security and stability can bring to you. It is a time for you to cultivate an more wholistic attitude to the material world to find an authentic happiness. In terms of love, this card can mean that someone dear to you is currently facing issues due to matters concerning his or her career. When it comes to finances, the King of Pentacles reversed is telling you to look at the long-term goal. You may be facing financial issues but do not look at yourself as a failure. Stay positive and understand that this is just a phase in your life. When given the chance again, do not make choices based only on the short-term picture. The King of Pentacles' appearance in a reading can indicate some sort of material loss or loss in reputation - beware that you do not replicate his mistakes.